The top selections of the 2009 draft were expected to make their teams' rosters and contribute this season. Tavares, Duchesne and Kane have stuck at the major league level and have impressed. 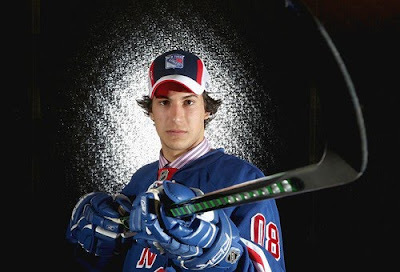 However, the standout rookie thus far has been 2008 draft pick, defenseman Michael Del Zotto of the New York Rangers. With tonight's Garden match against San Jose the Rangers' ninth of the year and thus the final game that Michael Del Zotto can play before this season kicks in against his Entry Level contract, The Post has learned that the 19-year-old defenseman will be moving. No, not back to the OHL — Hello? — but out of the hotel in which he has been staying and into a more permanent place of residence, for Rangers management has given that green light to Del Zotto and to fellow rookies Matt Gilroy and Artem Anisimov as well as to Brian Boyle. Del Zotto, a plus-three, is tied with Philadelphia's Matt Carle for the NHL lead in scoring by defensemen with eight points (3-5). He leads the rookie-scoring race by one point over the Islanders' John Tavares. He has been on the ice for all eight of the Rangers' five-on-four power play goals. "He has a nice strut to him," head coach John Tortorella said. "But he hasn't crossed the line." Del Zotto has been instrumental in the Rangers surprisingly fast start. His 4 goals is second on the team to only the red hot, Marian Gaborik. He has spent significant time on the power play, logged an average ice time of over fifteen minutes and has a game winner. Del Zotto's early season would have been considered a great start by his idol Scott Niedermayer. In fact if you asked Niedermayer today, he might say Del Zotto is his idol! Coyotes To Be Sold To the NHL?